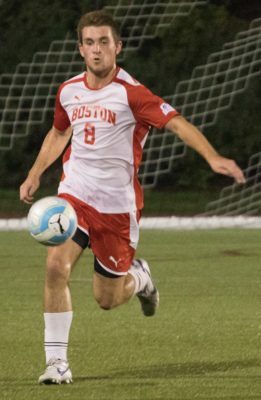 After a successful trip to Washington, the Boston University men’s soccer team returned to campus over the weekend with two wins and a tie in hand. Next up is a trip to Providence, Rhode Island Tuesday, where the team will face off against Brown University. The Terriers (2-5-1, 1-0 Patriot League) come into Tuesday’s game having just beaten last year’s Patriot League regular season champions American University 2-0. Sophomore forward Matt McDonnell provided an early goal and senior forward Eric Mubang added insurance to BU’s lead early in the second half. Sophomore goalkeeper Michael Bernardi recorded six saves in his third start of the year, including five in the first half. BU head coach Neil Roberts said he is hoping for a similar performance in Bernardi’s next start. “Mike will be in goal and he’ll have to do a good job, because the crosses coming in will be a little different than the American game, so it’ll be a big challenge,” Roberts said. The Mahopac, New York native did not enjoy the best start to his season. 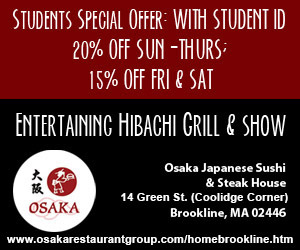 His six goals allowed over two games meant freshman goalkeeper William Bonnelyche was given the nod-in goal for the University of Massachusetts Lowell game. Bonnelyche had started the Terriers’ last five games before American (1-7-1, 0-1 Patriot League) Saturday and was slated to start once again, but was unable to play due to an injury during warmups. With Roberts placing Bernardi back between the posts, the sophomore will have another chance to impress before the bulk Patriot League play begins. On their longest stretch away from home this season, BU enjoyed a strong start with Saturday’s win, leading Roberts to an air of positivity about the rest of the stretch. The Bears (4-1-1) have enjoyed a productive and efficient start to their season, winning their first four games and not allowing opponents to score more than once during that time. During his first six games Brown’s senior goalkeeper Joey Cipicchio has only allowed three goals while owning a 0.875 save percentage, something that will provide a challenge for a Terriers team that has scored only four goals through their first eight games. Although the Terriers have scored all four of those goals in their last three contests, Roberts said he is confident in his team’s ability to find the back of the net. Opportunities have been there for a team that is averaging 10.1 shots per game, yet until recently it was unable to find a way to capitalize on each shot. BU will also have to limit the Bears’ opportunities. Forward Toby Howell leads Brown in points with two goals and an assist. Senior midfielders Quinn English and Nico Lozada additionally remain attacking threats, each with four points apiece. As they head into Tuesday’s tilt, Roberts is positive about his team moving forward.